I was given the paperback of this novel by my mum, who told me to read it straight away because she wanted someone to talk to about it. I was doing NaNo at the time and was slightly reluctant to plunge into the giant brick of a book that is 'The Passage' but I'm so glad I did. The Passage is a vampire story, but not one of vampires you would want to date. These are vampires who kill, in fact, not only kill but wipe out the world as we know it. The story spans a hundred years. Set it modern times initially, a group of government agents and scientists have discovered a virus which effectively turns people into vampires. To test the virus, twelve men on death row are brought to a secret government facility and turned into 'The Twelve'. At the same time, a little girl named Amy is abandoned by her mother on the doorstep of a nunnery. Amy isn't like other little girls. She is able to communicate with animals, and sometimes, it seems, the dead. Because Amy has no background, one of the government officials, Wolgast, is sent with his partner to collect Amy and make her part of the vampire experiment. However, everything goes wrong and even though Amy is infected with the virus, she doesn't react the same way as the men. When all the vampires are released from the facility, Wolgast runs with Amy and hides her in a cabin the mountains. Here the story jumps forward almost a hundred years. With most of the world wiped out, there is one containment left which houses a community of survivors. The place is surrounded by walls and lights to keep out the vampires - known as virals or smokes. The people living here - including a cast of young characters; Peter, Alicia, Michael Caleb, Mausami, and Sara - know nothing of the outside world or the world before the virals took over. Every day is a battle to survive. But when a girl called Amy, who is now a teenage girl, shows up, they discover a beacon and a way of finding out what happened to the world all those years ago. They set off on an epic journey which sees lives lost and others created, to not only discover the truth but also see if there is a way they can fight the virals once and for all. What I came to think of as book one (before the virals) and book two (after the virals) are very different. Other than Amy (and a couple of very brief surprise revisits to characters), the whole cast of characters is completely different, which I guess is understandable considering it's almost a hundred years into the future! However, it did throw me at first and I found myself kind of missing the characters from the old book. This didn't last for long though as I quickly got into the new characters. The virals are fast and strong, and there are some truly frightening moments in the book where the characters are literally fighting for their lives. There are some points in the book which are a bit slower, but considering the length of the novel this is hardly surprising. Overall, I wanted to keep turning those pages. Probably my only real criticism was that I did struggle to connect with Amy in the second part of the book. Where in the first part, my heart broke for her and everything she'd been through, because she didn't speak much in the second part or show much empathy or emotion at all, I did find relating to her in any way difficult. This, however, is my only negative point about the book and it's really only a slight one. 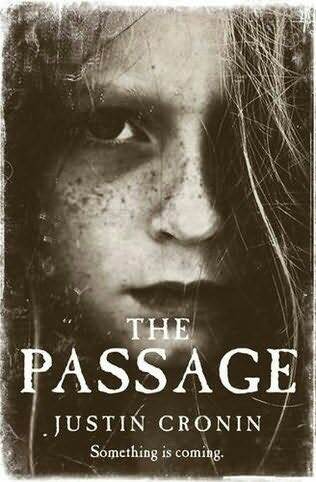 Overall I absolutely loved 'The Passage', staying up reading because I didn't want to put it down. This is the sort of book that inspires me to write: to write more, to write bigger, to write better. The moment I closed that last page, my mind was already working up an epic story which would probably take me years to write. But you know what, it doesn't matter if it takes years to write. If it ended up being the same sort of fantastic, inspiring tale that Justin Cronin created, it would be worth it. I loved the first part of the book and was knocked for a loop when it leapt forward to characters that I did not seem to care about. I guess I stopped too soon, huh? At some point I promise to try again. I totally understand where you're coming from Jimmy. I felt the same way when the story changed so drastically like that - not enough to give up on the book though! Thanks for stopping by! Maybe yourmom should start a blog too? Sounds like my kind of disturbed story "I hope our library has this. I did put this suggestion across to my mum, but she didn't seem to keen on the idea! Lol. I'm sure your library will have this book. As Jimmy mentioned, it was pretty huge a couple of years ago! Stunning review! You're making it even harder for me to work today and keep my nose OUT of the book. I love it so far!